Chop Champ the easy way to make great salads and more. Saves time and is easy to use just place ingredients into the cutting basket, rinse, strain, place cutting board base on top and flip over. Slice ingredients using guides. For a finer chop, rotate basket and slice again. Flip over, remove cutting base and you have perfect salad ready for you final toppings, dressing and ready to serve. The durable cutting guides, never worry about cutting fingers. Safely slice chicken and veggies for a delicious meal. Add steak or chicken to your salad quickly and easily. Perfect for fruits, melons, vegetables and so much more. If you love fresh herbs on your salad, Chop Champ has a built-in herb stripper so you can add them in a snap. The handy cutting board base can be used as a measuring cup and serving bowl. 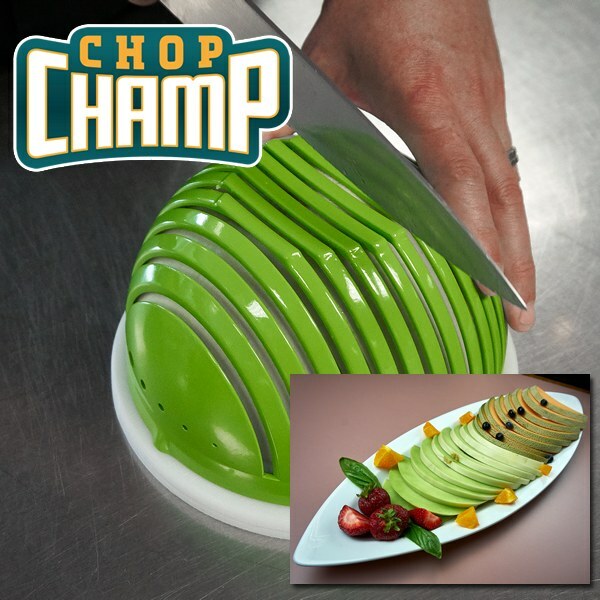 Chop Champ can be used for slicing bread! Receive the 9" Chop Champ big enough for the whole family, the 7" individual size Chop Champ, plus lettuce knife and recipe guide.